Are you looking for an adorable stocking stuffer that is not just another toys. I feel like kids get so overwhelmed by toys during the holidays, and I love the idea of giving something a little different. FunBites recently asked us to review one of their cool products, and we knew it was great for our gift guide. 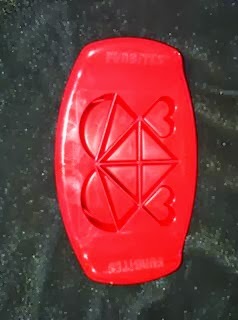 We were sent the red Valentine's Fun Bites (perfect for Valentine's Day too!) and my kids had a blast with it. 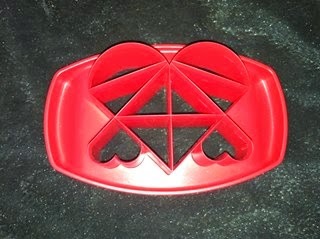 It is not a press, but it is more like a plastic cutter that is completely safe for kids to use. You press the mold on to something somewhat thin like bread, a sandwich, we even tried scrambled eggs and pancakes! 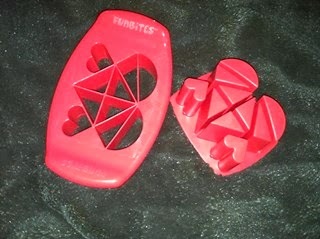 This particular FunBites made our item into a large heart shape as well as two smaller hearts. My kids loved both sides, as the other side would be used to make an impression, which they used with play dough and even when we made cookies! This is such a versatile tool, and I am thrilled that it is something even the youngest in the house can use. Because it is a larger item, my 3 year old had no problem handling it, and was thrilled to be in on the fun!